The cravat is an early version of a man’s necktie. It could be a plain piece of white linen tied around the neck, with the free ends falling below the throat. A gentleman’s cravat would have been decorated with fine lace, as lace was especially fashionable for men in the 17th century. During this period, the greatest lace makers were working in Italy and Belgium. France, however, wished to create a competing industry that would stop the costly imports of lace. This effort led to the recruitment of skilled lace makers who were set up in French towns such as Alençon and Argentan. 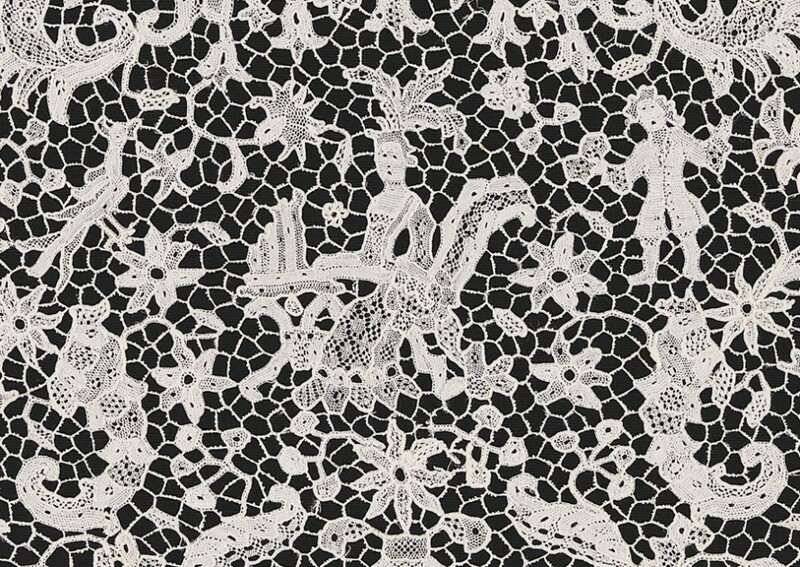 A new French style of lace gradually emerged through the influence of royally-appointed artists and designers such as Charles LeBrun (1619-1690) and Jean Bérain the elder (1637–1711). The lighter designs for needle lace with classical elements that resulted are sometimes referred to as Point de France. The emergence of early Rococo design is seen in the curvilinear motifs of canopies and arabesques favored by Bérain. In this particular cravat, the human figures, architectural details, and decorative motifs are isolated from each other so the abundance of detail won’t overwhelm the overall design. The design depicts musical entertainment and features, at the center, a woman under a canopy playing the organetto, a popular musical instrument typically played by women. Accompanying her are male and female singers holding songbooks, a male clarinet player, a male cello player, and a man playing a violin. A butler extends a cup on a tray while a shirtless figure in a skirt and headdress on one knee offers a basket. There are canopies, shells, flowers, and foliage that fill in the spaces between the musical performers. Despite the many decorative flourishes, the design retains an overall feeling of lightness. The cravat may have been made for the marriage of the Duke of Burgundy to Marie-Adélaide of Savoy in 1697, or it simply could be a celebration of cultural achievements under King Louis XIV. Cravat end. 1695–1699. Bequest of Richard Cranch Greenleaf in memory of his mother, Adeline Emma Greenleaf. 1962-50-18-b.